This work explores the observable order of the universe and the ways in which the natural sciences point to a discernible God. The author guides the reader in the search for meaning in the universe. 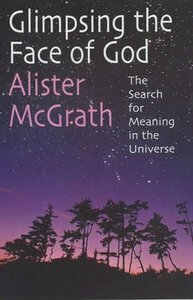 About "Glimpsing the Face of God"
Scientist, and former atheist, turned internationally-regarded theologian and prolific author, Revd Professor Alister McGrath, (D.Phil (Oxon), earned D.D. (Oxon) has been appointed to the newly created Chair in Theology, Ministry and Education at King's College, London. Formerly he was Professor of Historical Theology, and Senior Research Fellow at Harris Manchester College, Oxford. He is a world-renowned theologian, and is the author of numerous bestselling titles including The Christian Theology Reader; Theology; Christianity: An Introduction; A Brief History of Heaven, and Dawkins' God . McGrath is an Evangelical on the cutting edge of the interface between Theology and Science, and Theology within post-modern culture as indicated by his most recent publications A Fine-Tuned Universe? Anthropic Phenomena and Natural Theology(2009),The Dawkins Delusion? Atheist Fundamentalism and the Denial of the Divine and The Open Secret: A New Vision for Natural Theology.